Francis Marion Taylor, seventh child of John & Eliza, was born on the first day of January, 1843. His name first appears on the 1850 Federal Census for Hancock County, later Winston County, as Frances Taylor, 8 years old. At the age of 25, he married Elizabeth A. Smith, daughter of James M. and Martha Smith. Elizabeth was the sister of J. D. Smith, who was the second husband of Mary Mollie Taylor. So 2 children from John Taylor's family married 2 children from James Smith's family. Francis and Elizabeth were married in 1868, according to the census recording in 1900. By the age of 37, Francis Marion was the Probate Judge of Winston County. This occupation is listed on the 1880 Federal census record. His name appears on scores of documents from the county during that time. Unfortunately, a newspaper article from the Lamar News on June 3, 1886 details a scandal for Taylor and the county. F.M. 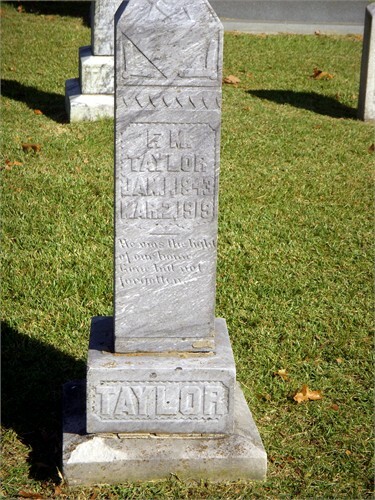 Taylor, Probate Judge of Winston County, whose whereabouts have been a mystery for some time, appeared before the Supreme Court and plead guilty to the charge of embezzlement which had been brought against him, and the judgment of the lower court removing him from office was affirmed. By 1900, Francis Marion and Elizabeth, along with their 3 youngest children, were living in Tecumseh, Cherokee County, Alabama. His occupation was farmer. Next door to Francis was his son, George Washington Taylor and family. Ten years later, Francis Marion was living with his youngest son, Charles Alexander and family, in the Ashridge community of Winston County. He was listed as divorced. On September 7, 1913, Francis Marion married Eliza Evans Pittman. Eliza was the daughter of Leverett and Sarah (Brown) Evans. Her first husband was Squire Pittman. Eliza was the sister of Sarah Sephronia Evans, who married William Carroll Taylor, brother of Francis Marion. So two sons of John Taylor married two Evans sisters. At the age of 76, Francis Marion died on March 2, 1919. He is buried at Liberty Grove Baptist Cemetery in Winston. After Francis Marion's death, his widow Eliza lived with her brother, George Milton Evans, and family in the Arley area. The location of the grave of Francis Marion's first wife has not been found. His second wife, Eliza Evans Taylor, is buried at Mount Hope Cemetery, Arley, Alabama.